Does increased focus on border security make the border less secure? Despite repeated incidents over the last year, Kyrgyzstan and Tajikistan remain unable to settle their Fergana valley border. A meeting last week between the two sides resulted in a draft agreement on 519.9 kilometers of the border but Bishkek and Dushanbe have been unable to agree on disputed sections. Both countries also have unresolved border issues with Uzbekistan, with which they share patchwork borders in the fertile Fergana valley, home to a growing population. The Kyrgyz-Tajik border is over 970 km long (the Tajik ministry of foreign affairs says 987 km; Asia Plus reported 971 km and has previously reported 978 km; 24.kg says 970 km.) Much of the border that remains undelineated rests between Tajikistan’s Sughd province and Kyrgyzstan’s Batken province. Trouble periodically sparks around the Tajik exclave of Vorukh. In August, Kyrgyz and Tajiks clashed near the village of Kok-Tash. Depending on the account, the order of events is reversed but includes Tajiks blocking a road to a cemetery used by the Kyrgyz villagers of Kok-Tash and the Kyrgyz blocking a canal supplying the Tajik village of Chorku. There were reports of rock throwing, gunshots, and damage to several houses. 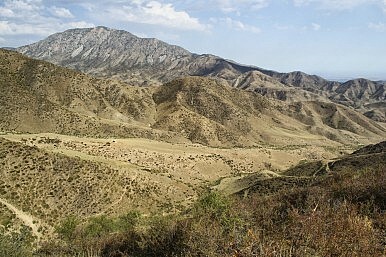 August was not unique, nor are border issues in the region isolated to the Kyrgyz-Tajik frontier. In May an Uzbek border guard killed a Kyrgyz potato smuggler. In July Uzbeks fired on Kazakh fishermen; Uzbekistan claimed a drunk Kyrgyz border guard fired a submachine gun at an Uzbek exclave; and two Tajiks had a run-in with Uzbek border guards. Sometimes incidents involve citizens and other times border services. In January 2014, the border services of Tajikistan and Kyrgyzstan exchanged fire. The incident included reports of a mortar attack. In April 2013, Vorukh featured in a clash between Kyrgyz and Tajik border guards. Reeves’ 2014 article for Eurasianet is an excellent read on the nuances of land, people, and local tension in the Fergana region. She points out that in the past Tajiks and Kyrgyz could move through and across the border with ease, and manage tensions at a local level, but increased focus on border security has exacerbated and in some cases generated conflict. Whereas once people were easily able to move across the invisible frontier, governed by local rules and history, national governments are trying to play a bigger role and not always doing so with sensitivity to local rules. That said, the border remains a national-level concern. Fluid borders pose a potential security risk and certainly feed into the booming drug trade from Afghanistan northward. Central Asia's inherited borders continue to cause problems.